As a board member of the Phoenix Zoo, I have the opportunity to see some of the amazing work that zoos worldwide have taken on to preserve threatened and endangered species. In the United States, the Association of Zoos & Aquariums leads the way in species preservation through its Species Survival Plan program. Zoos work together to manage their threatened and endangered species, cooperating in initiatives to ensure the sustainability of healthy, genetically diverse and demographically varied animal programs. At present, the AZA is working on the preservation of more than 115 species, including the giant panda, the California condor, the lowland gorilla and three species of tigers. It’s easy to get out of touch with how serious the plight of some species has become. We see them on TV, we enjoy them in zoos, and we think everything is fine. Don’t believe for a minute that it is. A century ago, an estimated 100,000 tigers roamed across Asia. Today, about 3,200 remain, and they live on only about 7 percent of the land they once called home. 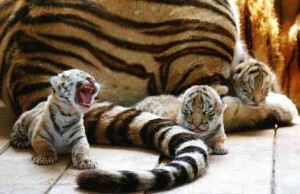 Much of the land has been rendered uninhabitable for the tigers by deforestation. Hunting by humans has affected the animals in two ways – first, by decimating the prey that tigers feed on, and second, by killing the animals themselves. Today, without immediate, drastic action, these magnificent animals could go the way of the dodo bird. The efforts of zoos to save them provide hope, but they’re no substitute for taking measures that will help restore their viability in the wild. Leonardo DeCaprio has taken on this cause as his own. People often mock actors for using their fame to promote causes like this, but I admire what he’s doing. You can learn more about his efforts here. If you want to get involved, check out this effort by the World Wildlife Fund. The group hopes to raise $20 million to double the number of tigers in the wild by 2022. Your participation could help make it happen. This entry was posted in Society, Sustainability and tagged endangered species, Leonardo DiCaprio, Species Survival Plan, tigers, World Wildlife Fund. Bookmark the permalink.